When I was growing up, my father would take me to a noodles shop and have the beef stew with hot rice before dropping me off at school. I love the steamy hot broth with distinct spice flavors. The beef was tender and easy for a kid to eat. 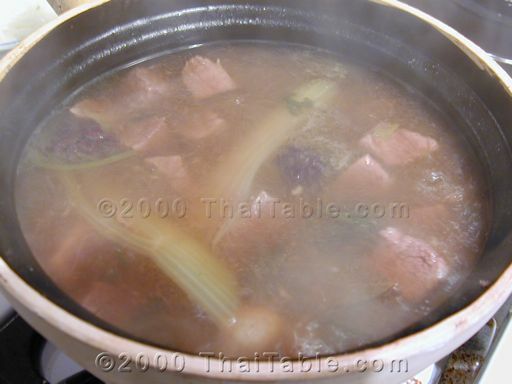 The beef stew is a very simple Thai dish to make. Put all the ingredients in and you only need to check it from time to time. If you have a crockpot, this will be the dish for it. Put the ingredients in the morning. Set you crockpot to do its work. If you have a timer on your rice cooker, time the rice cooker to finish the rice at the same time. When you come home at night, you’ll have a warm meal waiting for you! I usually make a big pot of the beef stew. The first meal would be with rice and subsequent meals with noodles. This beef stew is great with noodles or with hot rice. 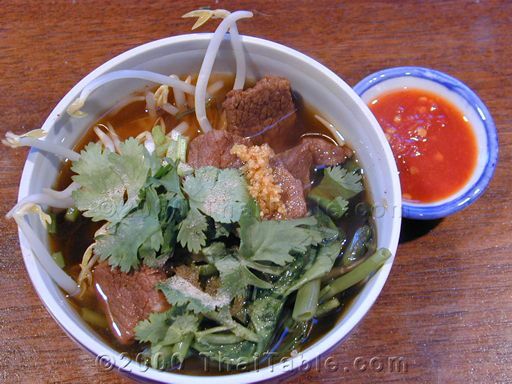 The flavor is enhanced by dipping the beef in vinegar chili sauce. Beef stew is a great dish to recycle your leftover steak! Cut beef into cubes, 1 inch x inch x inch. If you cut the beef smaller, it will require less time to cook. 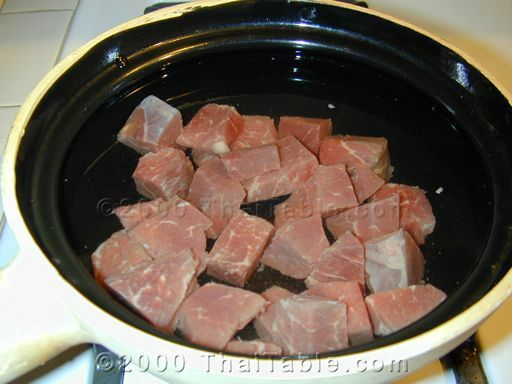 I usually make a big pot with various size of beef cubes for several meals. So some chunks will be ready soon and some later. Crush garlic. Chop green onions and cilantro. Set them aside for garnish. 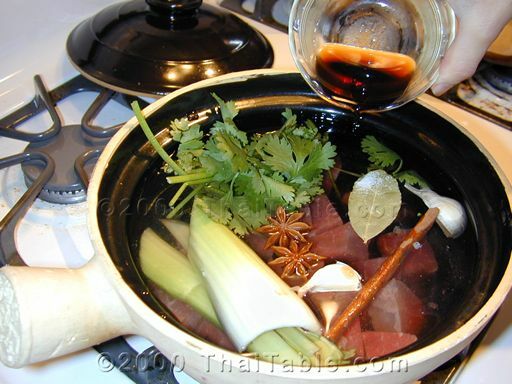 Put the rest of the ingredients, except for bean sprouts and ground fresh chili paste, in a large pot and cover the beef with water. Boil for at least 2 hours. You may need to add water from time to time. I strongly recommend make this dish in advance. The flavors come together better the next day. You know when it’s ready when the meats break apart easily. The meat and broth has a sheen to it. Cut lettuce into big pieces in a bowl. Add bean sprouts. Pour soup over. 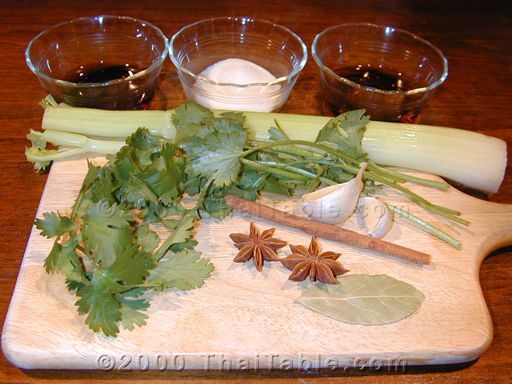 Garnish with sliced cilantro and green onion. Add a teaspoon of fried garlic. Sprinkle white pepper on top. Serve hot with chili garlic sauce.